I’ve got to be honest, I’m feeling totally ill-equipped to tackle this topic of short term missions. But, I’ve promised a series and a series you will get! I’ll tell my story with all I’ve got and I’ll dedicate it to the Lord trusting that His truth will ring true, even through my ramblings and limited experience. Also, whatever I told you I was going to write about last week isn’t happening. Is anyone surprised? If I asked everyone who’s signed up for a short term mission trip in the past 24 hours why they signed up, I bet 0 of them would say, “I’m just in it for me. I’m really looking forward to making this trip all about me and seeing what I can get out of it.” No! We want to serve. We want to minister. We want to be a blessing. But here’s the thing. While these objectives may be what we think we’re signing up for when we sign up for a week in Indianapolis or Monterrey, what short term trips too often become are short term ME trips. We plan a lesson or event or camp or project and we bring it to this group of people who need us so that we can come back and tell our church all about what we did, or even what God did through us. The problem is that when we show up in Indianapolis or Monterrey and the group of people there don’t respond well to our project or camp or when we don’t feel like we’re actually needed in the ways we expected to be needed, our real objective becomes quite clear. But here’s the thing, when you’re a short termer, it kind of is about you. Or at least it should be. And the sooner we acknowledge that, the better off we’ll all be. You’re going on this short term missions trip because it will be good for you to see how someone else lives. To see what God is up to outside of your church and your community. To learn about cultures and languages and programs and organizations and cities and countries and reservations and all kinds of things that you learn the most about when you dig in and live among. Something I really appreciate about YouthWorks is that they fully acknowledge – right there in their title! – that half of their focus is the youth (and others nowadays) that come on their week long mission trips. YouthWorks is all about the Youth + Community. 50/50. The Youth come and support what the Community is already doing. So really, when you’re going on a short term trip with YouthWorks, or any other organization or church really, it is kind of about you. You seeing Jesus where you are serving. You living without certain things for a while. You strengthening relationships. You going out of your comfort zone. You being flexible. You learning that it’s not really about you in the grand scheme of things, but also you realizing that pretending like you’re not aiming to get something out of this short term trip is really just lying. My lovely friend Erin lives in Detroit with her husband and her two seriously adorable boys. 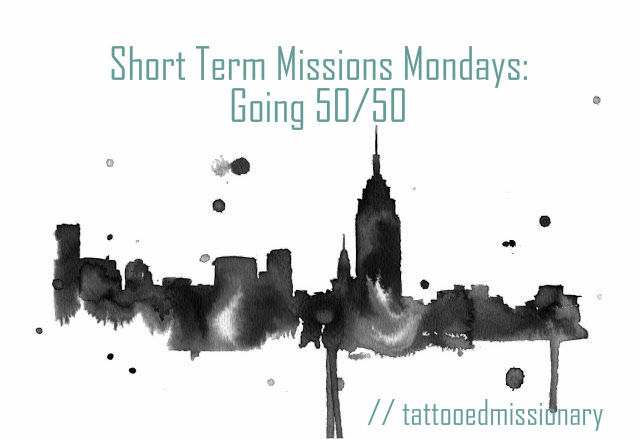 They are missionaries, right there in the Midwest, and something Erin shared with me when I asked for her thoughts on short term missions was the idea of short term experiences being 50/50. You + Community. Service + Education. Half and half. Doing + Learning. Hey short termers! When going on a short term trip (and in life) the best advice I can offer is to be a learner. Ask questions humbly, acknowledging that all you know is your little slice of the world – not because your slice of the world is bad or less, but just that it’s small and the world is so big. Short term trips are not only an opportunity to serve others, but an opportunity to learn from others. Let’s be honest, you spending a week in a city you’ve never been to before and will never visit again probably isn’t going to change that city drastically. It’s crappy to hear but you probably won’t be changing lives. 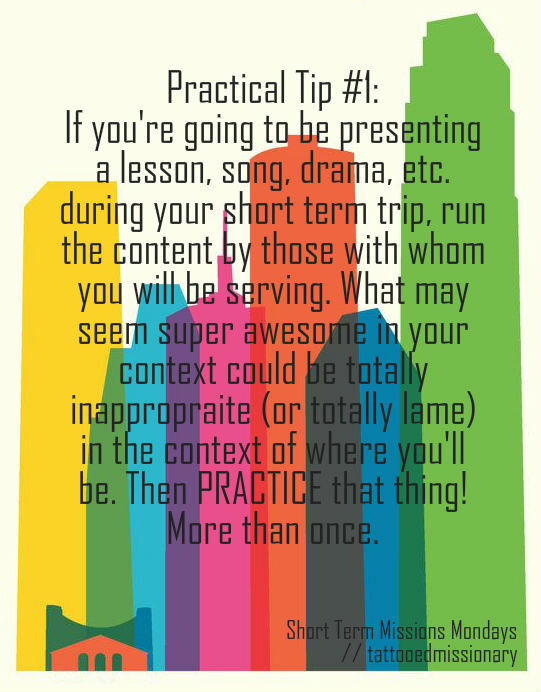 (Especially if you’re traveling internationally and don’t speak the language.) But that week in that city you’ve never been to before could change you if you surrender your expectations and assumptions and commit to being a learner. Hey long termers and leaders! When planning or leading a short term trip the best advice I can offer is to not be afraid to set aside time for instruction and discussion. When someone has spent hundreds of dollars to come have “an experience,” you, as a leader, can feel a lot of pressure to please those who came by catering to what they want to do. (Here’s where it’s okay to remind short termers that it’s “not about you!”) It’s tempting to play to their strengths/wants in order to make these people, who really have the best of intentions, feel useful. “Oh, you like kids? Okay, let’s have a day camp!” – even when the real need is cleaning and organizing the church office. “You like to bake cakes? Why don’t you teach the ladies of the church how to bake cakes?” – even when the real need is sitting with women and listening to their stories. Or cleaning toilets so that the women of the church who will be here for longer than a week can sit and listen to stories. Educate groups before they come and keep that going during the short term experience. Make it a priority. Spend time each day discussing what the group has experienced and learned. Acknowledge the discomfort that is going to arise. Acknowledge that there will be differences. Discuss expectations long before the group shows up, assuming they’ll be playing with kids all week when really what’s needed is digging and painting and hot-in-the-sun stuff. Share the heart of your ministry and organization, without putting up a front. Nobody is perfect. No organization is perfect. God works anyway. And teenagers especially will see through your BS. Hey Jesus people! Let’s do this thing 50/50. Us + Them. Service + Education. Learning + Teaching. Mary-ing + Martha-ing. Consuming + Digesting. Being Jesus + Experiencing Jesus. Talk to me!! Where you have seen this 50/50 model working really well? Where have you seen service attempts fall flat due to lack of education? How can we, as Jesus loving humans, educate ourselves about doing daily missions in the communities where we live? What have been your short term experiences and how have they been helped or hindered by assumptions or expectations?